With its Victorian design, the Queen Anne Floor Globe has a regal presence that's perfect for a formal library or office. Elegant hardwood legs are finished in cherry. An antique brass-plated full meridian complements the off-white oceans and colorful land masses. 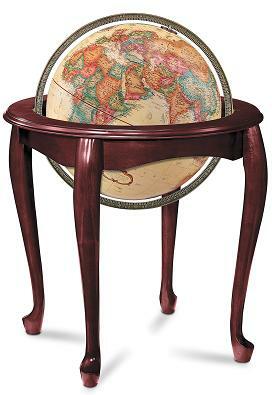 Replogle's Queen Anne Floor Globe is backed by a one-year warranty.